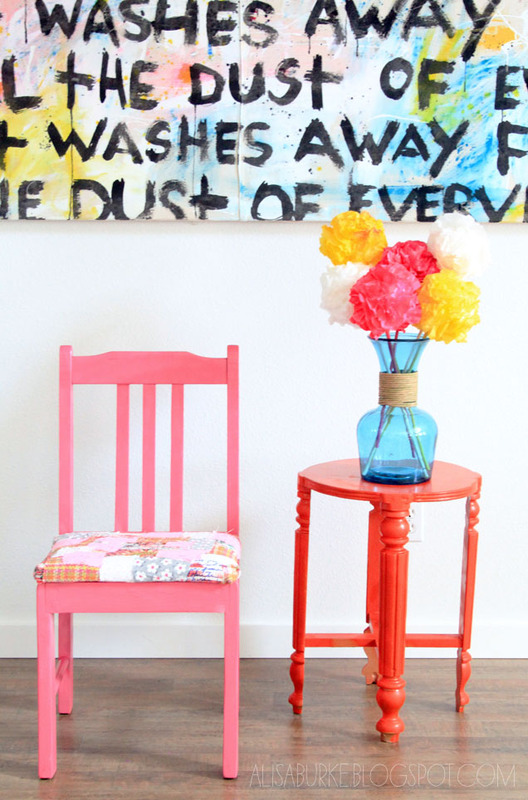 to transform a beat up chair into something a little more artful. 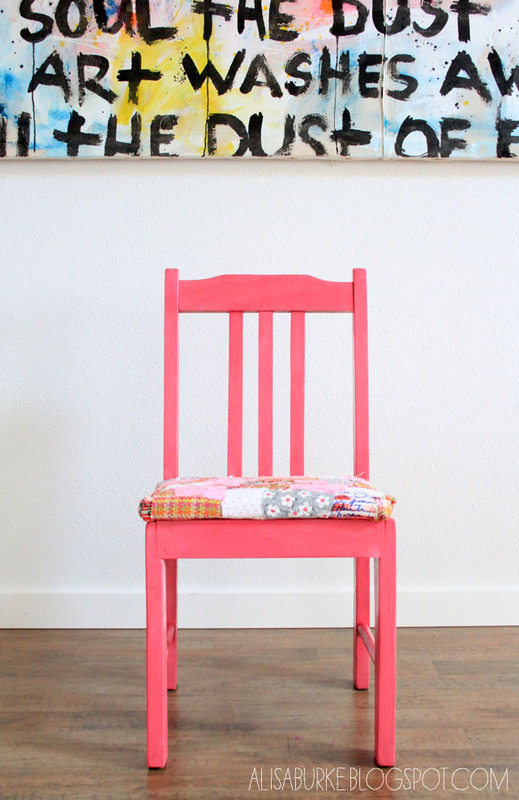 I started by painting the frame of the chair with bright pink spray paint. 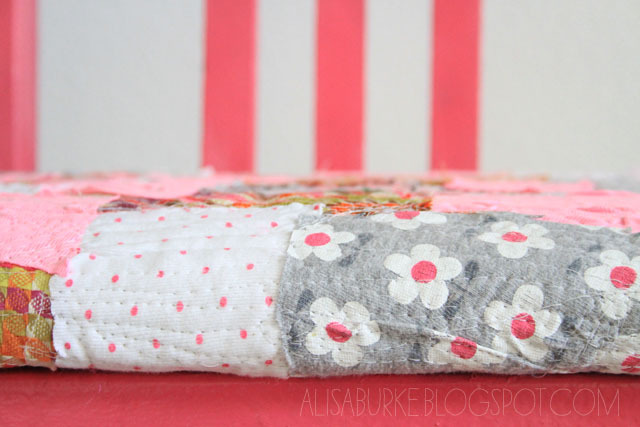 I cut a variety of squares from the fabric and arranged them on top of a piece of quilt batting. I pinned the fabric to the batting. Using my darning foot (or free motion foot), I sewed the fabric down to the batting. 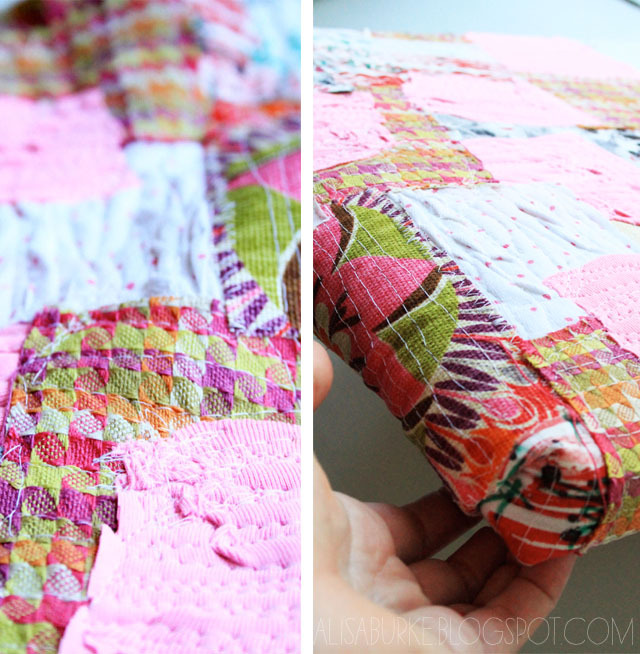 create another layer of texture to the surface of my fabric. and secured with my staple gun. Last, I secured the seat back onto the frame. 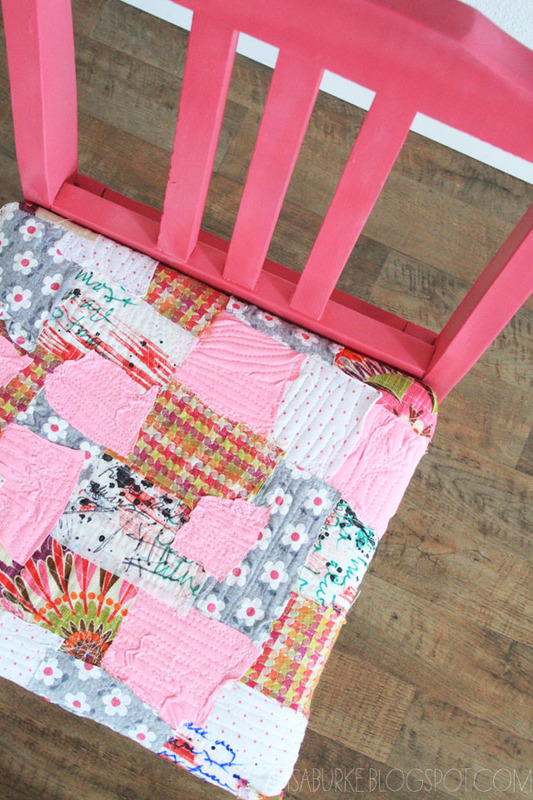 The result- a FUNKY and fun chair! WOW!! I love this so much, those colors/patterns together really ROCK!! Such a cute idea to go PINK too. 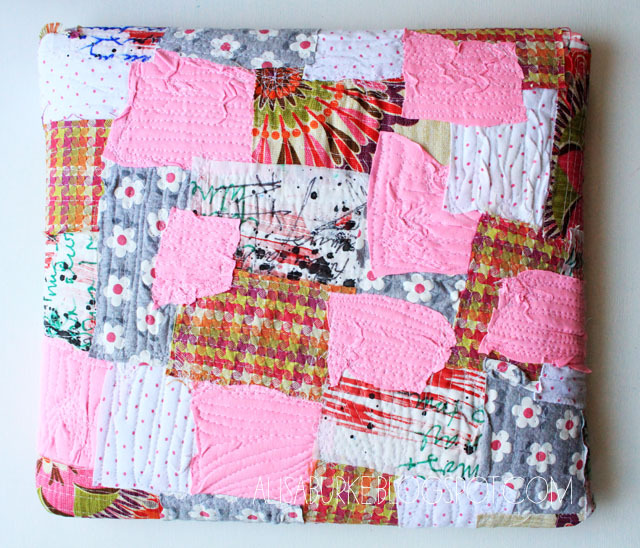 This is perfect for your studio, thanks for sharing the process of doing it too, so fun and freeing!! Thats vry pretty chair. Love the colous and the way they match. The chair looks amazing. I love the colour! I love the layers of fabric and the freedom you express in "sewing wild" with your darning foot. Looks so cool. Did you have your feed dogs down so the batting didn't catch? You have totally inspired me again to look at my chairs differently. I love this idea. 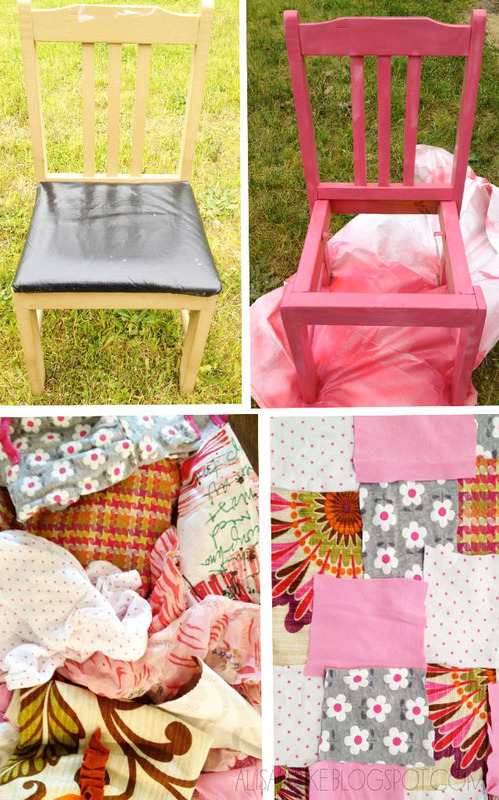 now only if my husband will agree to let me do this to my kitchen chairs that the can has destroyed. 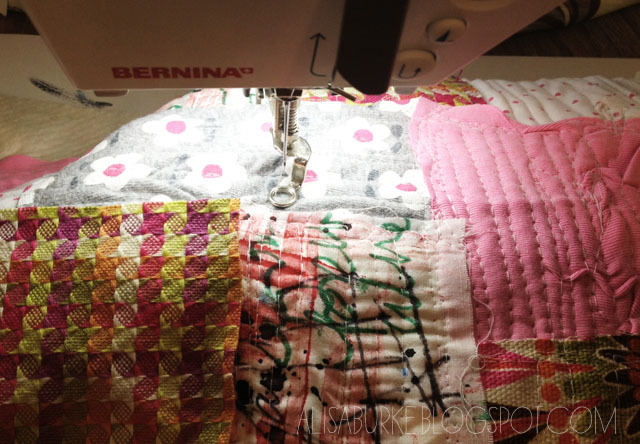 I love to do crazy quilting like this. I did an old piano bench and have gotten so much use from it since. Thanks for sharing I love the pinks. I love your scrappy chair. Here is an idea that you might like to do with Lucy. 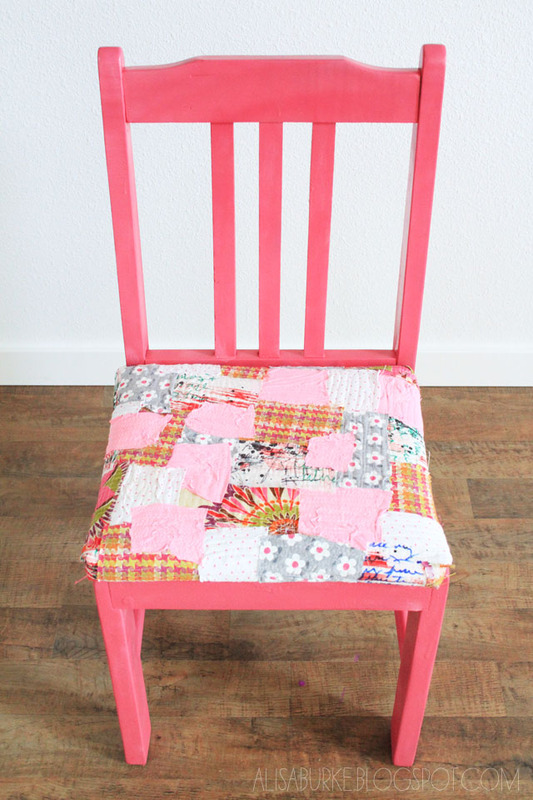 When our grand daughters were very young I bought an old chair at the flea market with no seat. My husband created a wire basket to hang down inside the chair and we filled it with dirt, planted flowers and put it in the garden. It was named "The Fairy Chair" and every year we "planted" the fairy chair for our garden. It became a tradition, but after a number of years outside it fell into disrepair and could not be salvaged. Alas - no more fairy chair. This year (after a few years of not doing this project) our 16 year old asked if we were going to do the chair this year. I need to go shopping because I realized that the chair was filled with very special memories! This is 100% original and awesome! I simply adore the idea and its outcome. It’s really really cute. Thanks a lot for sharing this wonderful idea. I wanna give it a try in our living room. Wouldn’t it be cute if we try making blankets out of those? What a fun idea!. There was plenty of choice, and all the styles were modern and fashionable, which ever product we chose I knew that the item would look good in the cafe.